outlook information. Schools offering Computer Forensics degreescan also be found in these popular choices. training and communications to co-workers on security issues. 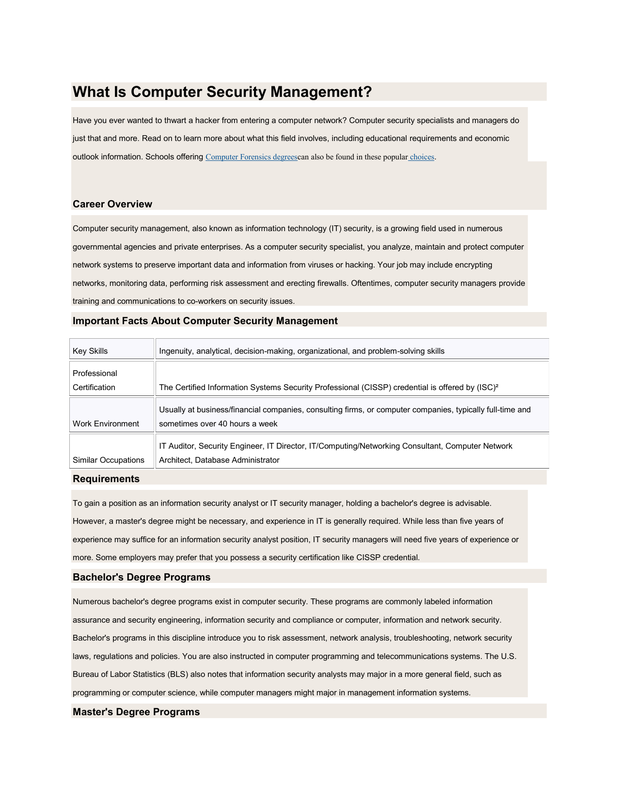 To gain a position as an information security analyst or IT security manager, holding a bachelor's degree is advisable. more. Some employers may prefer that you possess a security certification like CISSP credential. assurance and security engineering, information security and compliance or computer, information and network security. laws, regulations and policies. You are also instructed in computer programming and telecommunications systems. The U.S.
programming or computer science, while computer managers might major in management information systems. courses that you might encounter in a graduate program can include disaster recovery, cryptography and policy development. Typically, master's degree programs will also include graduate research and a thesis paper or project. experience growth that is much faster than average, while computer security managers will have faster-than-average growth. You can improve your job prospects by having experience in an IT area like networking or databases. median wages of $71,131 and $102,360, respectively. Maryville University responds quickly to information requests through this website. Walden University responds quickly to information requests through this website.